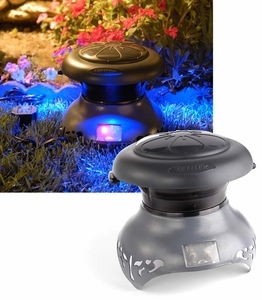 The Mosquito Trap Champion utilizes the documented attractiveness of body temperature (thermal imaging), color (exclusive blue light system), octenol (includes 1 cartridge, which is good for approximately 21 days), and airflow in an effective design to attract and capture mosquitoes and other blood-seeking flying insects. This trap assembles in seconds, weatherproof and can be placed anywhere in the yard. The Mosquito Trap operates by capturing a steady number of egg laying females, thus gradually reducing the overall local mosquito population. To achieve the best results from your mosquito trap, you must leave it in operation full time during the mosquito season. This product is not meant for occasional use, such as during an outdoor party. A capture of only a few mosquitoes daily will have a substantial future impact. In a few weeks you should notice a marked reduction in the mosquito population around the area, as well as a reduced number of mosquitoes in the trap. Since mosquito eggs can survive for several seasons, using the trap this season will also reduce the number of eggs hatching next season. Similar traps have been in use for years by universities, state monitoring programs, and researchers around the world. The Mosquito Trap Champion uses this traditional trapping approach, combined with the latest in ongoing research, to turn the female mosquito's natural hunting techniques toward seeking out the trap and facilitating capture in a product that private homeowners can use.